Nostradamus Predictions, New Psychic Future Predictions, Free Complete Prophecies: Nostradamus Explains to me, John Le Sainte, that Solomon is his Psychic Ancestor as well as Mine. Nostradamus Explains to me, John Le Sainte, that Solomon is his Psychic Ancestor as well as Mine. During our Psychic visits, Nostradamus tells me, John Le Sainte, many details of his life on Earth, which I wish to share to the world. So many documents related to the lifetime of Nostradamus were destroyed by many superstitious people. Not because these people feared the writings by rather that people believed that they conveyed magical powers. Nobles sought out the documents and copies of his original books and almanacs and ground them up into dust. This was then taken as a supplement powder to prevent the plagues and other illnesses ravaging France in the late 16th and 17th centuries. Nostradamus has explained at great length the Ancient Psychic Family relationship that we share. In our nightly conversations Nostradamus tells me that we are both of the Psychic Blood of Solomon. This heritage brings great healing powers and protection from illnesses. The world of modern science has abandoned the study of astrology and demonology in search for scientific cures. Nostradamus insists that demons still may possess souls, sometimes several at a time. These tormented souls are weakened, allowing in illness and disease. He remarks " Even in your day, does not a full moon drive the populace mad?" He is correct! A quick scan of the internet does find many sites describing the increased frequency of Crimes, Births and all sorts of other occurrences, even on heavily overcast nights. Nostradamus assures me that he and I both share the Solomon immunity to the various plagues, including "Le Charbon". His grandfather made certain that Nostradamus new about his true heritage as a true heir of the powers and protections of Solomon. Nostradamus has repeatedly shown me a "Magic Ring" in the visions that had been given to him by his grandfather and his grandfather before him. The ring contains the power and seal of Solomon to drive evil from men's souls. Nostradamus has promised that I shall come into possession of this ring in time, but he does not reveal how or when. 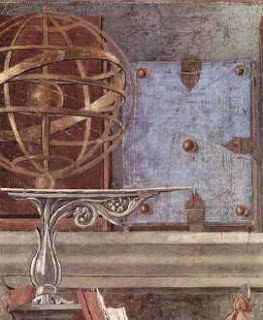 It is a very large Gold Ring in the center of which is set a large metallic stone with an almost prismatic appearance. Within these prizmatic reflections seems to float a "Star of David" type symbol which seems to repeat almost in the manner of a herringbone weave pattern in cloth. Nostradamus claims to have used this ring to cure many people and also removed demons from their souls. One of the great sadnesses of Nostradamus' life was his failure to save his own first wife and children from the plaque death. He tells me of his beautiful Andiette, so much like her lovely mother. She had given him two very beautiful children. The first a boy named Cesar in honor of Andiette's father. The second a girl as favorable and graceful as the mother, thereby becoming the third Andiette. He believed that the miraculous protection of Solomon's blood had passed to his young children. Nostradamus left his young family to fight the advancing plague. When he returned, he found his wife and two young children had succumbed to the black death, "Le Charbon". His blood of Solomon married to a woman of the Italian descent must have diluted the concentration of Solomon's protective powers in his children. Andiette's father blamed Nostradamus for the death of his daughter and grandchildren. Andiette was the "Apple of her father's eye" as we would say in English today. He was off in other cities helping strangers while his family died without his miraculous powder and Solomon's Ring. Andiette's father despised Nostradamus after that point and demanded the return of the marriage dowry. Nostradamus left his happy life in Agen. Andiette's father destroyed as many documents or altered records to remove any record of Michel Nostradamus from his life or that of his now deceased daughter. These events apparently crushed Nostradamus' spirit as he wandered through the countryside to forget his pain determined to develop his Psychic Powers of Prophecy to the fullest to prevent another similar tragedy. Nostradamus has never revealed the name of her father and looks downward in sadness if I ask for an answer. Nostradamus claims that he had the most admiration and respect for her father that any human being could have for another. 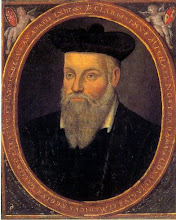 Later in life, Nostradamus grew his beard out to match that of his long ago mentor and named his second born son in honor of Andiette's father and the honor of his own departed first son. Nostradamus Psychic Predictions of the 2008 Presidential Elections John McCain Click Here for AMAZING and SHOCKING Predictions! Nostradamus visions as shown to Psychic John Le Sainte of the Upcoming New York City Earthquake, bridge collapse and train derailment. This Inspired Nostradamus prediction of the coming New York City Earthquake is described and interpreted in great detail. To return to the Nostradamus Predictions Home Page Click Here. Click Here to Read some additional Quatrains filled with new predictions of Nostradamus and John Le Sainte. Click Here to Return to my Blog Homepage, Nostradamus Predictions. Click Here to Read about Predictions of an Assassination of a Royal Prince by Nostradamus and John Le Sainte.